BLACK LABEL SOCIETY have released a new music video today for their song “Spoke In The Wheel” from their upcoming LP due out this spring. Directed by long-time director and collaborator Justin Reich, this is the first music video we’ve seen from the band since ”Trampled Down Below” was released last year from the Grimmest Hits LP. BLACK LABEL SOCIETY will release Sonic Brew - 20th Anniversary Blend 5.99 - 5.19 on May 17, 2019, via Entertainment One (eOne). “Spoke In The Wheel” is available as an iTunes instant gratification track, meaning fans who pre-order the album on iTunes will receive that single as an instant download. “Spoke In The Wheel” is available on all streaming services today. 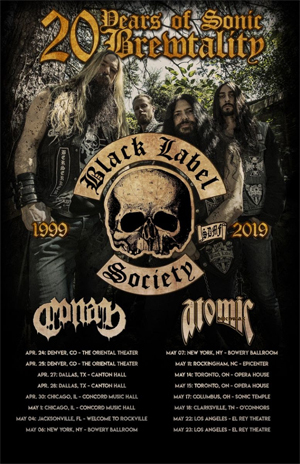 BLACK LABEL SOCIETY has also announced their "20 Years of Sonic Brewtality Tour", a brand-new batch of 2019 North American tour dates in conjunction with the new release. The band will play two shows in each market - the first night will feature Sonic Brew played in its entirety, while the second night will see the band play a set of greatest hits. Support will come from CONAN and THE ATOMIC BITCHWAX. BLACK LABEL SOCIETY will also participate in U.S festivals Sonic Temple, Epicenter, and Welcome to Rockville on this run. Dates begin April 24 at The Oriental Theater in Denver and wrap up in Los Angeles at the famous El Rey Theater for two nights ending on May 23. Tickets are on sale now.